Saw this in the supermarket on my recent trip to the America, and I had to include this in the blog. 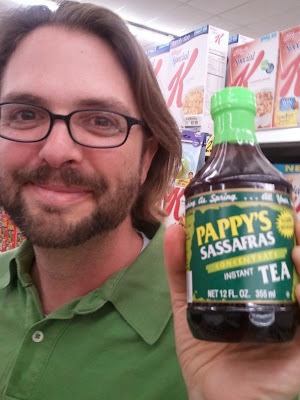 Found the website for Pappy's Sassafrass Tea, and thought you're life would be a bit less full if you didn't see this. As the site says, 'With Pappy’s there is no work, no mess and no tea bags to wring-out or discard!' 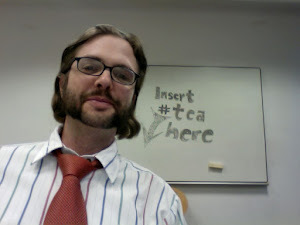 This is like the exact opposite of all the hassle involved in preparing green tea that I wrote about in the last post. I grew up in Lancaster, PA, and in the surrounding hilly forested areas, the Sassafras tree grows very well. I also encountered it where my mom's side of the family lived in Arkansas. I love this tree; one of my friends affectionately calls it the "Hand Tree" as its leaves look somewhat like hands, having either no lobes, or one or two thumb-like lobes. Something about the tree is very pleasant, the way it looks...its leaves, its deeply furrowed, rich brown bark, its peculiar shape (it's a medium tree with an oddly robust-looking trunk, growing upwards but usually not in a straight or direct way), and of course, the pleasing aroma that emanates from any part of the plant when crushed.